The Priest Who Predicted His Death? When Fr Thomas Bruno Rigby preached his last sermon at his beloved church of St Mary of the Angels on Sunday evening of St Patrick’s Day 1872, he prophetically exhorted the congregation to be prepared for death, observing there were so many unforeseen accidents that either he, or any of them, might be suddenly called away at any moment. Little did he know how true it was to prove for him. The following morning he set off from Leeds to Lancaster to attend the funeral later that day of Ripon priest, and old college friend, Rev Wilson. By the evening he was dead, the result of a horrific train incident. 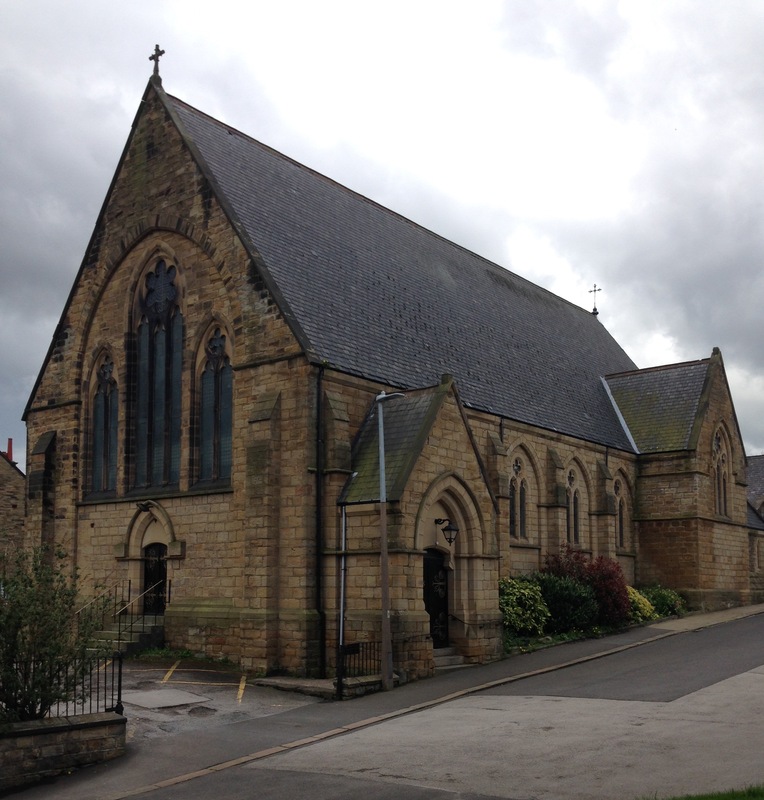 When Fr Rigby came to Batley in September 1867, the town’s growing Catholic community did not have a church in which to worship, this despite the first priest arriving in 1853 and land being purchased to build one in 1863. A letter dated 7 December 1863 in “The Irishman”, from the then incumbent Rev P Lynch, confirmed the land purchase, and indicated that the 1,500 Catholics were using a former rag and shoddy warehouse accommodating just 150 as an interim chapel. The letter was an appeal for donations from Ireland. 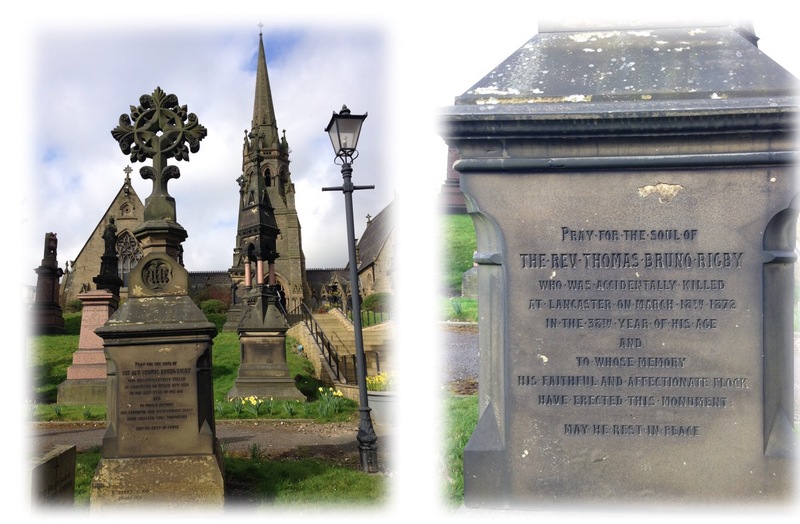 The hope was to lay a foundation stone for a new church on 17 March 1864. But this still had not materialised when Fr Rigby took up post. The newly arrived Fr Rigby felt it his bounden duty to remedy this. He immediately set about helping with raising money and putting plans into motion for a permanent place of worship for his flock. He quickly achieved his goal, assisted by generous donations from woollen manufacturing brothers Capt W.H and Simeon Colbeck (a convert to Catholicism). On 17 May 1869, the Diocesan Bishop of Beverley, Rt Rev Dr Robert Cornthwaite, laid the foundation stone, Beverley being the diocese under which Batley fell during this period. On 15 December 1870 the church of St Mary of the Angels at Cross Bank, Batley finally opened its doors to parishioners. Not only that, with his passion for education, Fr Rigby also established a Day School for the community’s children. But less than 16 months later, on 18 March 1872, 38-year-old Fr Rigby lost his life in particularly horrific circumstances. Thomas Rigby, son of James and Ann Rigby, was born in the Ellesmere district of Manchester in 1834. His family had a very strong Catholic pedigree. His mother’s cousin Dr John Briggs was the first Bishop of Beverley, and Bishop Cornthwaite’s predecessor. With a fondness for books and learning, Thomas also determined to become a priest and went to the English Catholic Benedictine school at Douai, in northern France between 1849-1856. From there he moved on to the English College in Rome where he spent a further four years, being ordained in 1860. Described as “always good”, not tempted by the splendour and art on offer in Rome, and according to the testimony of one “never late for morning prayers”, the impression given is of an unassuming, quiet, very studious individual, totally devoted to his learning and vocation. He excelled at mathematics, travelled extensively, was linguistically adept in Greek, Latin, Hebrew, French, Italian and German and had friends worldwide. Returning to England, he moved parishes frequently in the early days of his ministry. Posted initially to Burton Constable, Hull in 1860 he went on to serve at Bradford in 1861, North Kilvington 1862, Goole in 1864, Sheffield in 1865, St Patrick’s, Leeds in 1866 before finally coming to Batley to assist Rev. Patrick Lynch in September 1867. Soon after his arrival Fr Lynch died whilst in Ireland, and Fr Rigby succeeded him. It is particularly ironic that only weeks before his death Fr Rigby informed his friend and fellow-priest Fr. McCarten, that after all his earlier moves he felt at home in the town. He wanted to work there for the remainder of his life, so he might leave the church unencumbered by debt and lead the people he loved so much further advanced in their knowledge of Almighty God. His efforts have indeed had a lasting impact on generations of Batley Catholics, in the shape of the wonderful Grade II listed building where countless services, baptisms, marriages and funerals have taken place. Designed by John Kelly of Leeds-based architects Messrs Adams and Kelly, at a cost of around £2,364, the church was constructed in a Gothic Revival style, using stone from neighbouring quarries. Seating 650 on wooden benches, the internal walls were plastered and painted in a salmon tint, and the majority of the roof between the rafters in grey. I mention this, because these colours were maintained in the last refurbishment, several years ago. There are plans underway for another internal refurbishment, following major work on the roof. Back in December 1870 this slated roof, with a red earthenware ridge, was constructed by Messrs Pyecroft of Leeds. The apex of the apse roof was finished with leaded finial and a wrought iron cross; the copings of the gables with stone crosses. Of the other main contractors, according to newspaper reports, only one Batley firm – that of Mr J.W. Hey, plasterer – was involved. Alterations to the church took place in 1884 and 1929, but the building is essentially the same as in 1870. Many dignitaries attended the opening High Mass at 11 o’clock on Thursday 15 December. Diocesan Bishop and foundation stone layer, Robert Cornthwaite, returned to officiate, aided by clergymen from throughout Yorkshire. Cardinal Henry Edward Manning, Archbishop of Westminster, gave the sermon, along with a subsequent one at 6.30pm Evening Vespers, honouring a promise made to Fr Rigby that whenever he opened a church he would come to preach not once but twice. In between services, they repaired to the Station Hotel for a formal lunch. So, with a magnificent new church to house the congregation, Fr Rigby continued his ministry in the town. His enthusiasm for education shone through, urging the poorer members of his congregation not to neglect their children’s schooling because they could not afford the fees. Such was the value he placed on learning, he even paid out of his own pocket for a number of poorer children to attend the Catholic school. This in the wake of the 1870 Education Act, when parents paid schooling fees. He did not take part in broader local affairs to any great extent, but one of his last forays on the wider Batley arena was in connection with education, in particular that of the poor. The whole experience left him very bruised and disillusioned, with a feeling he had been unfairly treated and he had not been listened to in the same way other speakers were. A proud Englishman, his friends detected as a result of the encounter, he was beginning to realise the way in which Catholic priests were actually regarded by some compatriots. The meeting of the Batley School Board and ratepayers took place at the Town Hall on the evening of 20 February 1872 and lasted until 10.30pm. Described as a largely attended and excited meeting, it was called by the Mayor to discuss the contentious decision of the School Board to pay the fees of children whose parents could not afford them, at the local school of their choice rather than Board Schools – in other words public money potentially going to Established Church and Catholic denominational schools. Essentially ratepayers would be funding an element of religious education. The alternative, to restrict them to Board Schools, risked poor parents not sending children to school for reasons of conscience. The Board itself was divided on the issue, which they passed with the slimmest of margins. Batley was a mixed religious town, with a significant Dissenting population, alongside the Established Church and Catholics. The acrimonious debate, peppered with raucous cries from the ratepayers, saw Catholic Fr Rigby and J Wilberforce Cassels, vicar of St Thomas’ presenting a united front when speaking from the platform, much to the sarcastic amusement of those opposed to denominational schools. Mr Marriott’s jibe of “This man (addressing Rev Cassels and pointing to Fr Rigby), consigns you to eternal damnation as a schismatic – and you, I believe send him to a very warm place” typifies the comments. The heated debate ranged from objections to paying fees for children whose parents by their dissolute habits had brought themselves to a paupered condition, to freedom of choice and persecution; from accusations of seeking to use public money for their own religious purposes, to arguments about time spent on religious teaching detracting from education in reading, writing and arithmetic. Over 140 years later and nothing changes! “Mr Wormald Waring [from the secular camp] and the Rev T.B. Rigby, Roman Catholic priest, now rose together to address the meeting, and while the former was received with applause by a majority of those present, the latter was assailed with a storm of howls. The denominational party however cheered him”. The meeting concluded with a vote against the decision of the School Board and a warning that if the bye-law was enacted “it will produce the same animosity and irritation which was produced by the enforced payment of church rates”. The events weighed heavily on the mind of Fr Rigby, touching upon his religion, the possibility that one man could force another man’s child into a place against his conscience, and his strongly held belief in education of the poor. He wrote to Fr McCarten on the subject. We then come to the fateful evening of 18 March 1872. Fr Rigby was making his way back from that Lancaster funeral, held in the city’s St Peter’s church. Rather than returning direct to Batley, he and Fr Thomas Loughran of Leyburn made a life-ending choice. They decided to take the 7pm train from Lancaster’s Green Ayre station to Morecambe, to visit a friend. Some reports refer to it as Green Area, replicating the error in railway timetables up to around 1870. They arrived shortly before departure time. Fr Rigby stopped to talk to two ladies, whilst Fr Loughran enquired of porter William Walker how long they had before the train left. Upon being told it would go in a minute or so, they decided they would have time to go to the toilet. Fr Loughran made it back to the train in the nick of time, the whistle blew, the doors closed, the guard gave the signal and train set off, driven by John Winter (who hailed from Hunslet, Yorkshire). Before getting into the brake van, Northamptonshire-born guard Thomas Sturman noticed Fr Rigby and warned him not to attempt to board. The platform was brightly lit, well maintained and, as William Walker oddly described it, there were no pieces of orange peel lying around. The short-sighted Fr Rigby was still seemingly trying to ascertain his companion’s carriage. He spotted Fr Loughran and made an attempt to reach him. Another Northamptonshire-born man, foreman porter Edward Garley (some reports incorrectly say Richard Gorley) saw Fr Rigby walking sharply down the platform as the train set off and cautioned him twice to keep back. He and labourer George Allen saw the priest miss his step and stumble between the platform and moving carriages. Gorley, only a yard away, tried unsuccesfully to catch him. He immediately called out for the station officials to switch the signals to stop the train, which quickly drew to a halt. But it was too late. A carriage had passed over the priest’s chest and arms. By the time William Walker reached him, he was dead. His body was conveyed back to the presbytery at St Peter’s, where the inquest headed by coroner Mr Holden returned a verdict of “Accidental Death”. On the evening of Thursday 21 March his remains arrived back in Batley by train. Several hundred people processed from Cross Bank Batley to join the crowds already waiting at the station. Shops closed their shutters as a mark of respect and thousands lined the route as the hearse containing Fr Rigby made its way back to church, where his oak, flower-strewn coffin was placed on a bier in front of the black draped wooden altar. The church was full. Those unable to get in were allowed walk through the church, past the coffin and out via the sacristy. The church was similarly filled to overflowing for the funeral, held the following morning at 11 o’clock. Over 30 priests attended, and long-time friend Fr McCarten preached the sermon during which almost all the congregation shed tears. He expressed gladness, in the midst of sorrow, hearing it was in the exercise of charity, attending the funeral of another priest, he had met his death. He went on to say he had built his parishioners a church “where they would have consolation administered, and where they would be carried at last”. More information about the St Mary of the Angels roof fund is here.